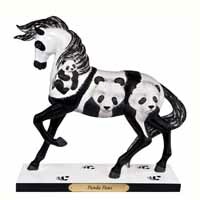 Panda Paws | Retired Ponies Figurines | One Price Low Flat Shipping! From the Trail of Painted Ponies 2015 Fall 36th Release, Panda Paws Horse Figurine. Designed by artist, Lorna Matsuda. Made of stone resin. Measures 7" tall. This unique figurine was intended by the artist to honor and celebrate the endangered Panda Bear, hunted for years in China due to the belief that its pelt provides protection from evil spirits. It is poetic that this jet black and brilliant white gentle giant home to bamboo forests is artfully depicted on a body of its equine counterpart!